Sharing my recipe for yummy sweet potatoes, as I think it's appropriate now that its October!! Can you believe it? Time is flying, it was just summer like a week ago. Fall is my most favorite season, and this month I'll be sharing some of my favorite seasonal recipes. 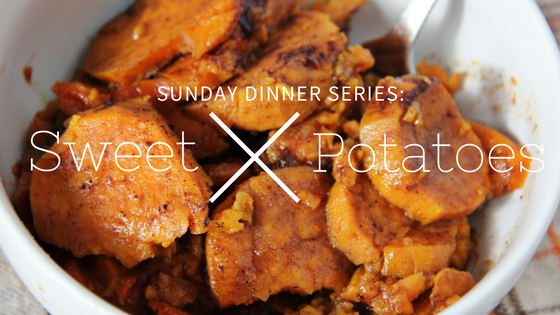 To start, I'm kicking off October with my sweet potato recipe. Super easy, great as a side dish, and great to freeze if you make a big batch, and want to save the rest for a later time. I enjoy sweet potatoes with Fried Chicken, but this dish can be served with any type of meat. Enjoy! 1. Start by washing your sweet potatoes thoroughly. They can come really dirty, and even though you are pealing them, I always make sure to wash the outsides, because you don't want to work with dirty food. 2. After your sweet potatoes are washed, peel them, and chop into 1/4th inch pieces. Can be diced, but I keep it simple and chop my sweet potatoes in the form that they came, so my pieces come out in circles. Rinse these off under cool water thoroughly. 3. Get a large skillet out, and put on medium heat. I usually put 1 stick of butter chopped into my skillet, and then all of my sweet potatoes. Once your potatoes are in, add about 1/2 cup of sugar, a generous amount of cinnamon, and a generous amount of nutmeg. I do not measure how much I use because eventually I'll be adding more of each seasoning. Your potatoes will start to cook down, and carmelize, and you'll be able to taste what you need more of as they begin to cook. 4. Cover your skillet, and do not stir. Once the heat sets in, and your butter starts to melt, it will creat a "steaming" affect to your potatoes. With your sugar, cinnamon, and nutmeg covered on the top it will begin to caramelize. I cook on medium heat until I see my butter at the bottom of the skillet start to bubble, then I turn my stove to low heat. 5. Let cook on low for half hour, stirring occasionaly. My first stir is after I see my sugar starting to carmelize at the top, and my butter is bubbling. I stir very sparingly, as the potatoes will start to get really tender, and you don't want to accidentally break you potatoes, or mash them. My rule of thumb is, when I go to stir, to taste the flavor that comes off on my spoon. If it's lacking sweetness, I add a generous amount of sugar, if I need more cinnamon I add a little more, and so on for the nutmeg. Careful adding nutmeg because it's such a strong flavor, so when I add nutmeg I do so sparingly because I don't want it to overpower the sugar and the cinnamon. 6. After about a half hour - 45 minutes, your potatoes should be tender. You should be able to put a fork straight through them, with the potato coming right off the fork. This means that they are ready. The cinnamon and nutmeg should have darkened your potatoes at this point, and you will see the caramelization in the skillet. That is the best part of the sweet potatoes, as it just puts the taste to this dish over the top. Serve immediately, as you don't want your wet ingredients in the skillet to coagulate. And there you have it! Yummy, easy, and the best sweet potatoes you'll ever taste!!! Warning, I wouldn't eat this dish on the regular, as it is high in sugar, so I treat myself and family to this dish every blue moon, usually paired with Fried Chicken (because that's how grandma did it :) ) but like I said, you can play around with the amount of this recipe because the dry ingredients are not measured, and you can use however many potatoes you like. If you make too much these are easy to freeze, and re-thaw for a later dinner.